Shelly Caravan Park - Shelly Beach Accommodation. 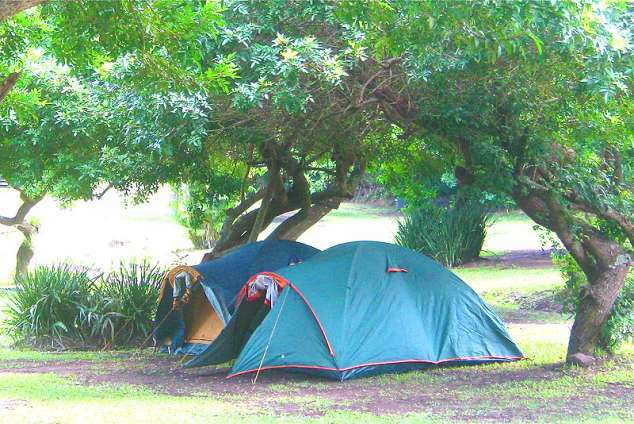 Shelly Caravan Park is a peaceful camping and caravan resort situated in the seaside town of Shelly Beach on the lower South Coast of Kwa Zulu-Natal. The resort itself is set around it's own private dam in the countryside and yet it is just five minutes drive from the ocean, and close to all amenities. The resort offers large treed stands with electrical plug points whilst incorporating an enormous sparkling swimming pool, recreational hall (with 2 x table tennis tables (bats not supplied), darts board (darts not supplied) and pool table), a large wooden jungle gym outside for the kids and a gazebo with wooden tables and built in braais. The tranquil surroundings attract an array of birdlife to the park such as fish eagles, kingfishers, herons and many more. The dam creates an oasis for both flora and fauna to thrive which makes it such a privilege for all our guests to experience. Our dam is stocked with bass and talapia. Fishing is permitted on catch and release basis only (rods are not provided). Small pleasure boats and kayaks are available at no extra charge. Picnic tables and benches provide the perfect setting for a quiet sundowner at the water's edge. Communal gazebo for all social occasions. Two unisex individual bathrooms each with a toilet and bath. A lovely one bedroom fully equipped self-catering cabin situated on the edge of our dam. Double sleeper couch with extra bedding in the lounge - suitable for teenager or 2 small children. Satellite dish installed with flat screen TV - personal decoders with smart card must be brought for link-up of dstv. Alternatively, a decoder with premium bouquet is available from reception at an additional charge of R30.00 per day. Parking space next to the cabin for one car. Full alarm system linked to security company. Private undercover sun deck with 6 x seater table and portable braai. If you want a day of adventure, there are activities right on the doorstep, be it zip-lining, swimming with sharks, quad biking, horse riding or visiting the nearby waterpark. Alternatively you might prefer a day on the beach. The lower south coast caters for all. There are busy beaches, quiet beaches and blue flag beaches - the choice is up to you! 7769 page views since 11 Oct, 2016. Last updated on 11 Jan, 2019.